This is an emotion filled journey, to be sure. The more we spend with our Shorthairs, the more we love them. The more we love them, the tougher it is to let them go. Now these are mixed emotions indeed. We truly love to see the joy that people experience in adding the right dog as a member of their pack. And we get just as much joy in seeing their new 4 legged friend set off on what will be their life’s journey. The very purpose they were bred and created: to share joy with their humans and hunting family. That doesn’t make it easy to let go, however! The longer we have with any pup, the more we get attached. Of course the ideas of how we can keep them, and where they would fit in, start creeping into our hearts. Can you imagine our pack if we indulged that?! We’d be at 100 GSP’s and growing! Hawkeye left our home last spring, destined for a wonderful puppy-hood; only to find his family amidst trying life decisions. Thankfully, they made the tremendously hard decision in his best interest, and asked us to take him back for re-homing. That was early November. Of course he’s had many birds and a lot of time cuddling on the couch since then. We all have different definitions of what ‘started’ means. Even more so to what a finished gun dog is. I mean, in the dog world, we use the term ‘finished’; but we strive for perfection and never ending improvements. When is a dog (or any of us) ever finished? 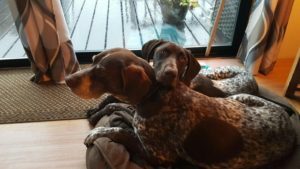 So not only are we looking for the very best scenario for the dog, but I have inner turmoil over a definition and the struggle for what is unattainable. How can I let go of this project/product/child before it is perfect and complete? I’m sure many of you struggle with something similar. Note to self: change industry language to eliminate ‘FINISHED’ gun dog from use. Alicia certainly voices her attachments and desires more than I do, that shouldn’t be a surprise. She is also very skilled at seeing when I am blinded by mine, also not surprising. 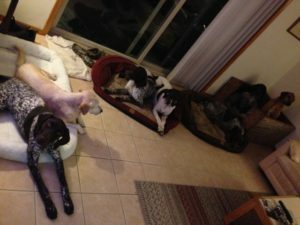 When a local young family recently came out to meet the dogs, I gave my normal spiel on puppies, active families, and how picky we are about homes for started dogs. After they left, Alicia asked me if I was closed to Ryan and Amy as a possible home for Hawkeye. 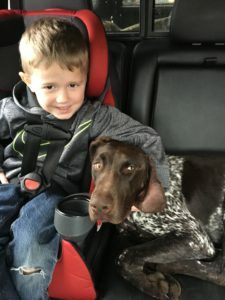 ‘Not at all,’ I said, ‘I think they could be a great home.’ She filled me in on what I didn’t see: That the family was very enamored with the pup, but felt as though I didn’t allow it to be an option. Turns out I get pretty attached too. So with the helpful direction of my lovely partner I made the call and discovered, indeed, they would love to take home this amazing young shorthair. In fact, while hunting that afternoon, their two young boys told Dad repeatedly, “If we had Hawkeye, we could shoot that bird.” and “We’d do better if Hawkeye were here.” Youngsters ready to hunt with a pointer? Ben is sold. I let them know my procedure for placing a started/grown dog: visiting their home. Touring their property. Knowing their daily routine and lifestyle. And finally a 2-3 week trial period, before full adoption; to be sure that everyone adjusts to happy and content. I’m not ashamed that I’m cautious here; that is not currently up for changing. However this family accepted the commitment by diving in fully. Buying equipment, building pens and fences, having beds ready. Trial period be dammed. That commitment certainly removes my doubt of the situation. Now it’s all up to them and Hawkeye. Of the 3 parties in the trial period (young family, Hawkeye, Ben); it is clear that those two have the least issues to overcome! So in finding new homes for many dozens of dogs, have we truly learned to Love to Let Go? Definitely not. But we truly Love, and therefore have learned to Let Go. Really great stuff! Love your commitment to these amazing critters that bring so much to our lives. They deserve the kind of thought when being placed in a new home. I love this! We got to meet this dog yesterday and he is a sweetheart! !